We bring our one of the most latest Designed Doors specially manufactured keeping in mind the safety, security with utmost beauty & grace for Hotels, Resorts, Banquet, Multiplex and so on. Whereas Wooden Doors have a life of 10 years these Doors guarantee approx 30 years life with low maintenance cost. Metal is considered a green building material compared to wood. These Doors stand up far better when talk about the no affects due to Weather change, yes to resale value, Light on Weight etc compared to Wooden Fire Door. 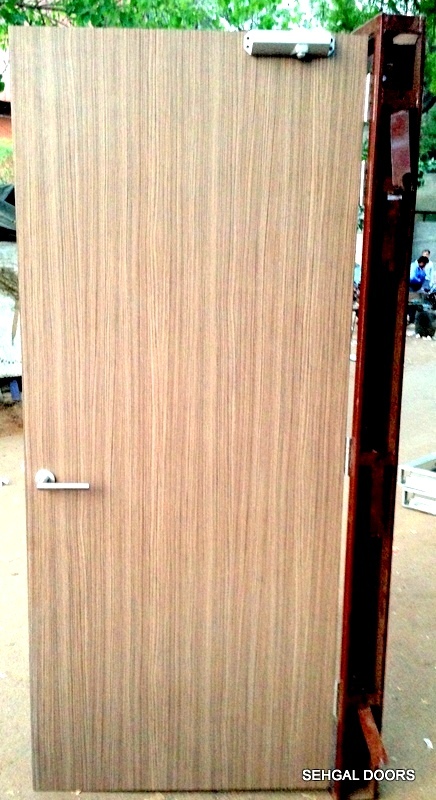 We strongly recommend Metal Fire Door with Lamination against the Wooden Fire Doors. Manufactured in Mild Steel and Galvanized Sheet. Available Fire Ratings 30, 45, 60, 90, 120 minutes. No welding joints and sharp edges interlocking at the stiles. Lamination sheet available in 0.8 or 1mm. Lamination can be one side or both the side depending upon the client requirement. Provides Safety & security with beauty & grace. Easy To Install & fix at site with the help of Holdfast installed on Door or through Dash Fastner. Final Finished available with zinc phosphate storing primer, polyurethane paint or powder coated on 1 side or lamination of approved shade as per the client requirement. Tested and certified by CBRI Roorkee & Fire & Safety Association of India (FSAI).